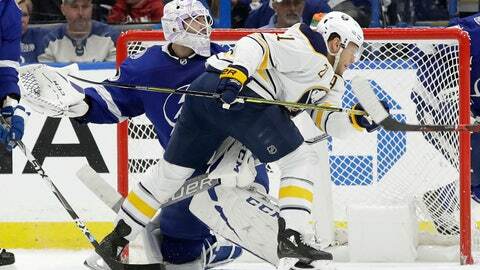 TAMPA, Fla. (AP) — Cedric Paquette broke a tie with 5:41 left and the Tampa Bay Lightning ended the Buffalo Sabres‘ franchise-record-tying winning streak at 10 games with a 5-4 victory Thursday night. Donato, recalled Wednesday after a demotion to Providence of the AHL, tucked the winner past Robin Lehner on the Bruins‘ fourth attempt. Boston has earned at least one point in five of its past six games.